Mon 1/1 Happy New Year's Day! All day: Free Day at Norm Waitt YMCA in South Sioux City! 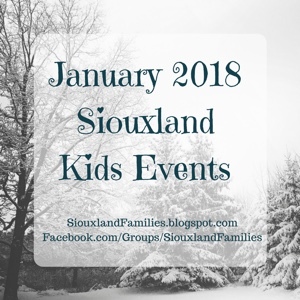 10am: Nature Tales: Snow at Dorothy Pecaut Nature Center, for preschoolers with a parent or other adult caregiver, call (712)258-0838 or e-mail TKruid@WoodburyCountyIowa.gov to register. Dress warmly-event includes an optional hike outdoors afterwards if weather permits!